Trish has already posted her review of the Gitane Organ e-bike, and I’ve had mine for less than a week. So this review is really a case of first impressions. I’ll probably write a fuller review when I’ve put some real distance on the bike. My bike – already accessorised. When Trish’s bike arrived, a month before mine (grumble, grumble), I was struck by the air of quality. It was the same feeling you get when you unbox a MacBook Pro or Nikon. That feeling has remained for the bike itself, although not so much for some of the minor components. Being a Dutch-style, step-through bike, the tubing is beefy. The use of aluminium helps keep the weight down, but with the battery it still tips the scales at a hefty 22.5Kg. It does instill confidence in the bike’s likely longevity, though. It’s designed more for comfortable cruising than speed. It has a fairly long-trail geometry and a well-reclined seat tube. The cassette and chain ring supplied with the 7-gear power train offer relatively low gearing. Having been used to 15-speed road and mountain bikes, I was surprised by how quickly the bike outruns my ability to pedal when going downhill, and I just have to sit there and freewheel. That’s not a bad thing for the kind of relaxed cycling we plan to do. The 28in (700C) wheels give a smooth ride over the local, poorly maintained country roads. However, the tyres are cheap and nasty (I’ve found them online for $2 a pop, if you buy 1,000) and will be replaced soon by the ubiquitous Marathons. The pedals are also awful. Their hard plastic means that, while there’s some attempt at providing a tread on them, your foot slips constantly. On my first few trips I was forever having to re-position my feet, which wastes energy and diminishes one’s confidence. As soon as possible, I replaced them with some cheap (€10.99) mountain bike pedals fitted with toe clips. The difference this has made is spectacular. The electric assist takes some getting used to. You can leave it switched off, at which point you appreciate just how heavy a bike this is. Or you can use three levels of assist, called ‘eco’, ‘standard’ and ‘maxi’ in the manual. These have speed limits of 15kph, 20kph and 25kph. If you exceed the top speed – as I have done on many occasions when going downhill – the assist simply switches off until your speed drops again. This is a legal requirement in France, possibly in Europe. On occasion, when I’ve switched off the assist, because I’ve reached a flat stretch of road, it’s felt like the brakes have come on. Again, the sensation is as though there’s drag from the motor. This may just be psychological, but it’s something I’ll look into some more and report back. The motor is in the hub of the front wheel, which means that when you’re pedalling, this bicycle becomes an All Wheel Drive (AWD) vehicle. I don’t know if that’s a good thing, but it feels like it ought to be. It does mean, though, that removing the front wheel – to fix a flat, say – is marginally more complex than on an ordinary bike, as you have to disconnect the power supply. It also means that the bike tends to understeer on corners – something you need to allow for, especially at speed. Given the sit-up-and-beg cruiser design of the bike, I’m actually rather pleased at how responsive and controllable it is. I’m not going to be doing any BMX-style stunts or hacking around mountain trails on it, but there is a very positive sense of control. The Gitane Organ comes fitted with a rack, complete with rat-trap, which also forms a protective frame for the large 36V battery (we chose the 14.5Ah version; the Organ also offers 8Ah and 11Ah versions). The rack is strong and generously sized – possibly too much so. 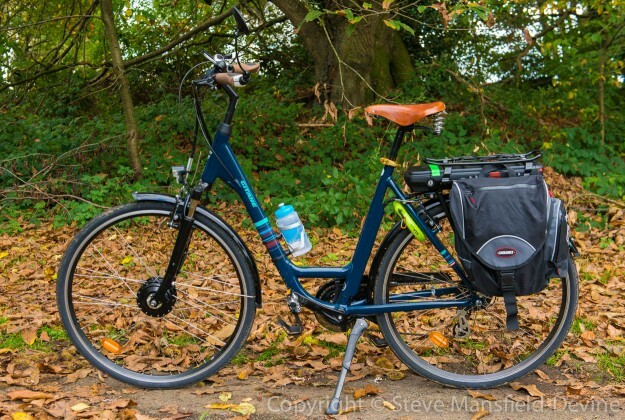 There are oblong-shaped bars either side of the battery that take individual panniers well – at least the two models we’ve tried – but are so far apart that they can cause a problem with the kinds of double panniers that come joined together. Trish is using RCP panniers of this type, but with a slight struggle. I’ve gone for Carradice Carradura panniers. Now for some of those components. We’ve talked elsewhere about how we’ve replaced the Kinetic saddles with gorgeous Brooks B67 and B67S models. I won’t say much more about that here other than that, after a handful of rides, with the maximum being 20km, the Brooks has been comfortable and problem-free. We’ve also posted elsewhere about the locks and the lights. I’ve added a bottle carrier, which involved using strap-on mounts because the Gitane has no lugs provided for this purpose – an oversight I feel. Having arthritis means I’m also fussy about grips. The ones supplied are adequate, but Trish found them a little too, um, ‘ribbed’ for her liking. My recent experience of riding my old Peugeot reminded me that I tend to spend a lot of time guiding the handlebars with the heels of my hands. I’ve always done that, but more so now that my fingers are stiff and painful. So I invested in some Ergon GC1 Biokork grips. In addition to having a wide area that supports the heel of the hand, these grips also have a forward sweep (unlike the more often cited and popular GP1 grips). This slightly counteracts the backward sweep of the handlebars, putting your hands and wrists in a more natural and comfortable position. I’ll review these grips more fully soon. The Organ is at the bottom of Gitane’s e-bike range. And I think this shows in two ways. 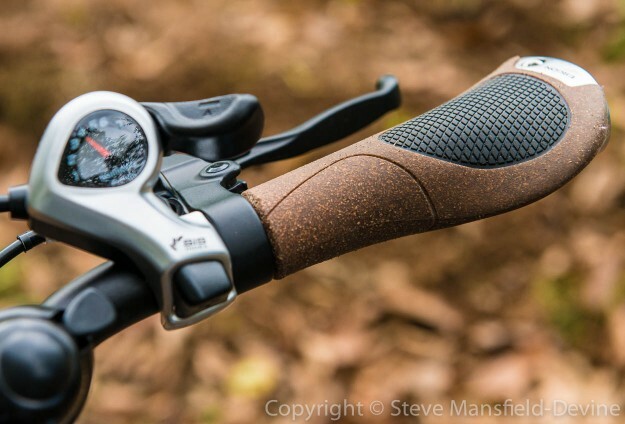 First, the quality of the bike itself is excellent – no doubt benefitting from the materials, manufacturing capabilities and research that goes into the whole (generally more expensive) range. But the finishing touches – ie, some of components, such as tyres, saddle and pedals – have a distinct cost-cutting whiff about them. Fortunately, they are all easily replaced, and in doing that you have a bike matched to your needs.